THIS eVening the weather was so perfect that i took a walk without feeling cold! Again minnesota is expecting 8 inches of snow tonight...as a reault coming days will be little colder here in Chicago. I cooked Brown rice with Cholia last night. Deep foods Cholia was frozen. I store Brown rice packet in refregirator and when they cook they turn almost white! They are chewy and you feel filled up early!!! 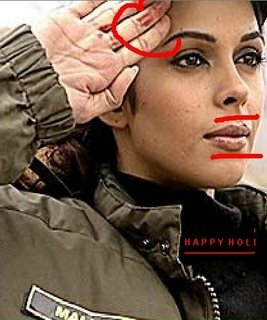 Unlike In Ladakh there was no Mallika Factor In Chicago on holi, so we almost had a black Holi! Hope the Jawans had real Fun and OOOOOmph! !